It’s been almost a month since South Carolina fans spent their Saturday at Brice-Williams Stadium. After three emotional games on the road, the Gamecocks are coming home with an unfortunate loss to Tennessee and a huge victory against the previously undefeated Missouri Tigers. Coincidentally these two teams -Tennessee and Missouri- will take the field this weekend in what should be an entertaining SEC battle. But all of South Carolina’s attention will be on Brice-Williams Stadium as the Gamecocks take on the Mississippi State Bulldogs in hopes to earn their 15th straight win at home. With both teams coming off narrow wins last week, they’ll need to put last week’s emotions behind them to focus clearly on the game ahead. And although South Carolina defeated the #5 team in the nation last week, there were some mistakes that the Gamecocks will need to correct moving forward in order to propel their team to the top of the SEC East. Mike Davis fumbled twice last week, and special teams have always given them trouble. Ball security and special teams may be the key to South Carolina winning against Mississippi State this Saturday. Looking at the Bulldogs schedule and record for the season, it is easy to dismiss them as an easy win for South Carolina. However, the last time these two teams met in 2011, South Carolina only squeaked by to earn a 2 point victory. Connor Shaw is questionable this week after being sick with a stomach virus, and the South Carolina coaches are being conservative about whether or not he will be ready to compete on Saturday. If Shaw can’t take the field, Dylan Thompson is ready to go, but Gamecock fans may be weary of Thompson starting after his less than best performance start against Missouri. Ultimately, an injured Shaw unexpectedly entered the game to save the team from defeat. If Thompson starts against the Bulldogs, will a sick Shaw have to save the team again? One thing that may help South Carolina this week is the return of running back Brandon Wilds, who according to Spurrier, may be available to play. Wilds injured his elbow in the Central Florida game and has not returned since. 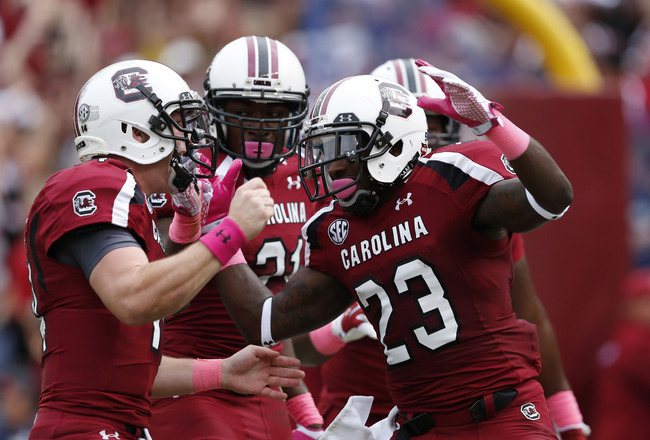 With Wilds back on the field, South Carolina’s offense will only be stronger. On paper South Carolina and Mississippi State’s offenses look comparable. The Gamecocks’ offense averages 31.9 points and 475.1 yards per game with 15 total turn overs this year. The Bulldogs offense averages 30.1 points and 456 yards per game with only 6 total turnovers. But once you look at the two teams schedules and performance, it’s clear that South Carolina is a much more talented team than Mississippi State. What the Gamecocks need to improve on the most is ball security. Sloppy turnovers could cost the team a major upset.